Fifth-graders at the Pangyo Campus of Korea International School showcased inventions for rehabilitating the environment at the Eco Trade Show held at the school located in Seongnam, Gyeonggi Province, on Friday. 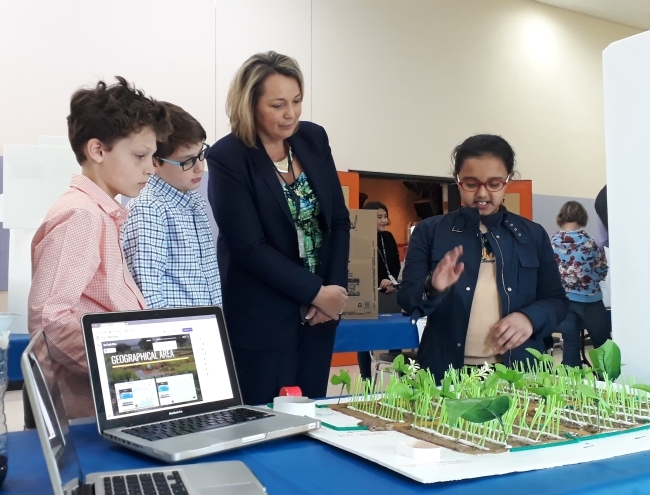 Some 70 students in fifth grade had each designed, built and tested prototypes to solve an environmental issue during the past trimester, with help from high school students at the KIS. The halls where the event took place were abuzz with teachers, parents and students moving from booth to booth, checking out each prototype and asking questions and taking pictures. “The high school students, who were their mentors, are coming in to see the final process and asking hard questions, (like) ‘how can you get the cost down, because I really like your product but it’s too expensive?’ Kids will have to answer all those questions on their own,” said Danielle Rich, Pangyo elementary principal at the KIS. According to Rich, the idea of the Eco Trade Show is that students are presenting their prototypes to investors or nongovernmental organizations that can make the prototypes into actual products. Fifth-graders were required to select relevant NGOs as their marketing targets, as well as specific regions across the globe to focus on. One fifth-grade student, Esther Winklehner, chose to reduce the amount of water wasted when cooking food or making jeans, which purportedly requires around 6,800 liters per pair. Her product will be able to obtain clean, reusable water by distillation and targets Chile, where one of the driest places on Earth, the Atacama Desert, is located. Another fifth-grade student, Aashna Anand, devised a product to solve farming environmental problems by recycling mud. Mixing mud with dead plants, she said it could be used as a fertilizer for crops. The “transdisciplinary” aspect is what makes the Eco Trade Show different from science fairs in other schools, according to school principal Rich. For students to showcase their final inventions at the Eco Trade Show, they had to incorporate what they had learned from social studies, science, math, reading and writing classes. What the students learned connected to the single project each student worked on during the trimester. “My goal is for any adult to be able to come in (to a classroom) and say to any child, grade kindergarten through fifth grade, ‘what problem are you solving right now?’ And I want them to be able to (answer),” Rich said. Based on what they had learned in math, students knew how much their products would cost and changed their product or target area when the target of their product lacked necessary resources. What students had learned in reading classes was helpful when conducting research for their projects. Collaboration among teachers was also a significant part, says David Lee, a teacher who helped the fifth-graders in the designing stage of their prototypes. For all classes to point to a single driving question of how each student will “design, build and market a product as environmental engineers,” teachers all “sat down together, thought about these projects together,” said Lee. All the while, fifth-graders were the main actors at the Eco Trade Show. High school mentors were not there to help them, and the fifth-grade inventors had to answer some challenging questions on their own, hoping to make their ideas appeal to the adults. “I think one thing I’m really proud of is how hard our teachers work in terms of giving the students opportunities to really just be in charge of their own learning,” said Rich.